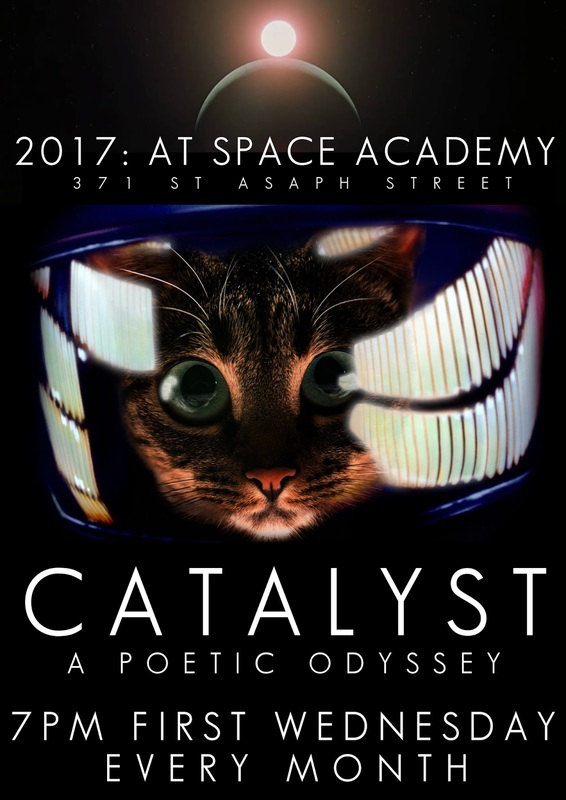 Catalyst Crazy Pre-Christmas, Pre-Launch Book Sale! Note: actual event may differ (wildly) from image. We're getting pretty close to launching volume 14 of Catalyst. Which means we're scrimping and saving every penny to get it over the line (and avoid the eye-rolling of our ever-patient and supportive printers). So to that end, we're bringing our annual December book sale forward a month to November. Next open mic is coming up on Wednesday 1st November and we'll be selling all available issues of Catalyst, and other Republic of Oma Rāpeti Press publications, at our infamous, never-to-be-repeated prices. This year we're also inviting our wonderful community of poets, writers, scribblers and friends to come along and donate books for sale towards the cause of fundraising for the next volume. Thank you to everyone who has already offered up books, we salute you! Speaking of the next volume, issue number 14 will be launched on Thursday 23rd November at Space Academy. 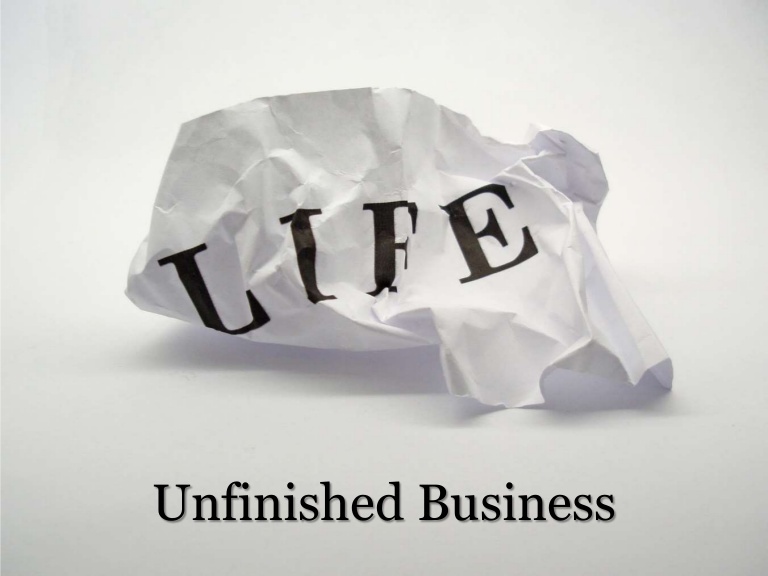 Stay tuned for further posts about this as Catalyst navigates into its awkward teens heroically unearthing literary lava in the twenty-first century. Christchurch Poetry Slam 2017 - a new champion! It was a full house at Space Academy for the 2017 Christchurch Slam. 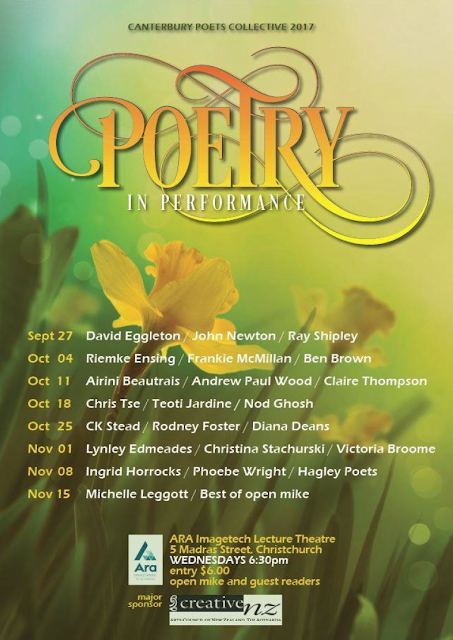 Every seat in the house and a fair few empty kegs pressed into service along with cushions and blankets on the floor as the enthusiastic crowd cheered on a smaller than usual field of poets - not that you'd notice from the intensity. The audience judges had to use fingers and toes due to a certain MC's forgetfulness but this just added to the hilarity as scores and half-points were demonstrated in a variety of dextrous gestures. Names were drawn out of the teapot of glory by various audience members including former slammers. 2016 ChCh Slam Champ Ray Shipley gave a guest appearance before the final announcments to cap off a pretty thrilling and intense night of poetry. The year rolls around so quick! The New Zealand Poetry Slam is on again in November, in Hamilton. So it's time to find Christchurch's champion to take on the unruly northerners. Once again we're pleased to be hosting the Christchurch Poetry Slam at Space Academy. Thursday 12th October, 7pm registration, doors open. Remember: to compete you must be available to travel to Hamilton for the 4th November. For the official rules see here. NZSA Canterbury - Free Writing Workshops This Week! 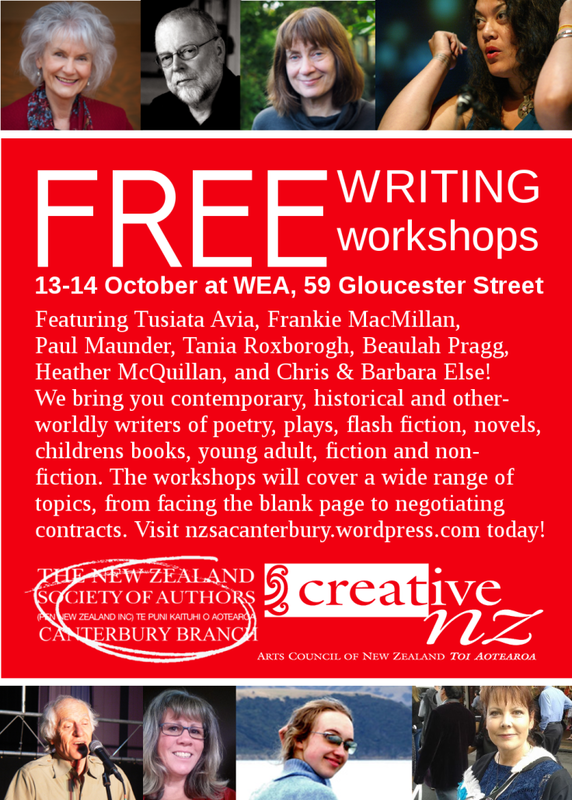 Pulled together by the New Zealand Society of Authors - Canterbury Branch, this Creative New Zealand-funded series of workshops are FREE! 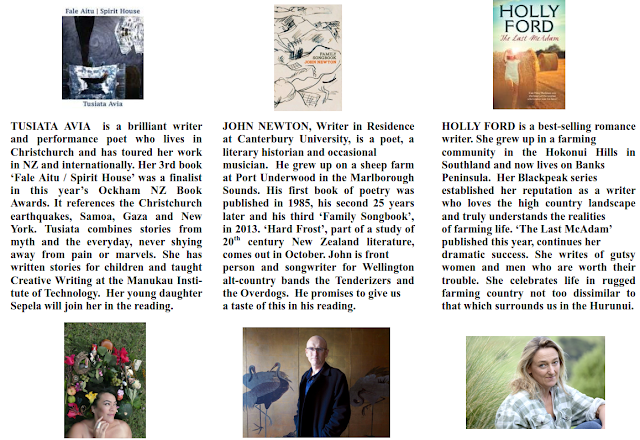 Don't miss out on the chance to work with some very fine NZ authors. 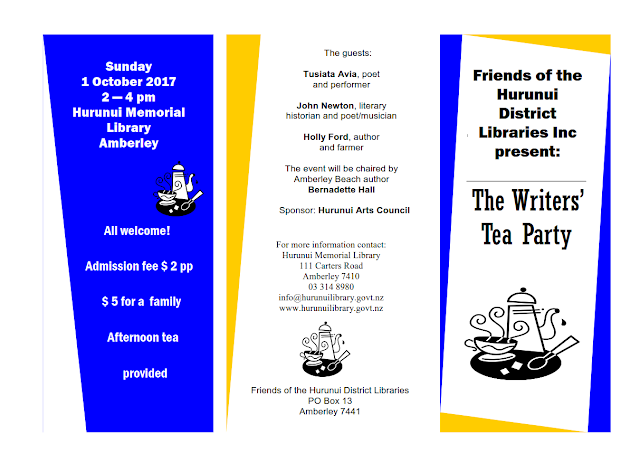 A notice in support of this event, happening in Amberley and chaired by Bernadette Hall. The event features performance/readings by Tusiata Avia, John Newton and Holly Ford. Entry is just $2 per person or $5 for a family including afternoon tea! Splendid! Sometimes they are decided by the participants but October's theme came to me out of a moment of frustration. Unable to complete a half-baked poem, I wondered if I could read it anyway. It occurred to me that probably most people have unfinished works that may or may not see the light of day and this could be fun. 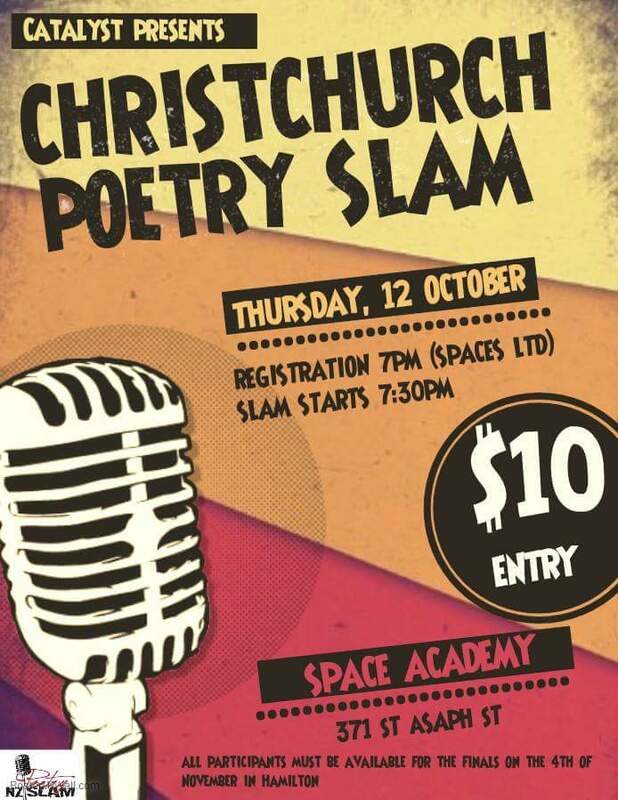 Here are the official rules of the Christchurch Poetry Slam as per the NZ Poetry Slam. 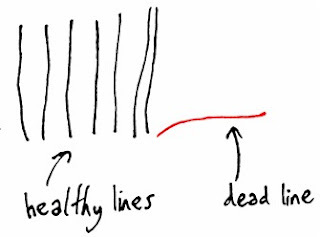 Time starts when poet speaks, however while poets can have time to settle and adjust microphone etc, this time is not limitless; ideally a poet should start before 10 seconds.